Hop aboard Ron Cherubini's Pirate Time Machine to reconnect with East Carolina sports legends. Love or hate him, Jeff Connors won’t care. Even a mention of the former, long-time strength and conditioning coach at East Carolina University evokes any of a number of reactions all up and down the emotional spectrum. The passion that his name conjures up in his critics, his fans, and those who say they don’t care is a testament to at least one thing about the man who dared to go to Chapel Hill: Jeff Connors loves his work and his players and it shows. Regardless of political posture, what is undeniable is that the recipe for a decade of Pirate football success included a heavy mix of Connors, and what has followed in the wake of his separation from ECU has been a program that hasn't been as successful on the field. That is not to say that Connors’ departure led to ECU’s football decline, but it does underscore the fact that he was a key part of a winning formula for East Carolina football. Connors is the first to admit that he wears his emotions on his sleeve, and that sometimes, it gets him trouble. He also realizes that because of this, a lot of what he would have liked to have done in the lead up to his departure did not happen. Still, in retrospect, with a few years of distance between him and his ECU tenure, Connors prefers to conjure up the positive memories of a time that he recalls as almost magical. And though during the tempest that immediately followed his departure he wasn’t exactly embracing the commentary coming from Greenville, Connors today holds no ill will toward the Pirates and their fans as a collective body. In reality, Connors is still very connected not only to many of his athletes, but also to many within the school and community. They are his friends and fans. Before he moved on, however, life was good… very good at ECU. Jeff Connors came to ECU in 1991 as the tradition-proud football program was trying to figure out if the schedules of the mid-‘80s – aimed at ratcheting up the profile of the team and school – had done more to embarrass the program than take it to the next level. For Connors, who was wrapping up a Master’s Degree at Bucknell University, where he was the strength and conditioning coach, the schedules had obviously not done much in raising his awareness of the university that he would soon call home. “I thought East Carolina was actually Western Carolina,” he said. “... I had been in Tennessee so I thought of Western Carolina first." Connors was linked to the opportunity via the then-strength coach from the Philadelphia Eagles, Ronnie Jones, who had heard about the position from then-ECU assistant coach Steve Logan. Connors went through the necessary interviews and started to get hooked on the opportunity that ECU presented for a strength coach. It would be remiss to define Connors as simply a disciplinarian. It is more his focus on accountability through discipline. And it was just what the doctor ordered for an ECU program that had, indeed, grown by a trial by fire in the mid-to-late ’80s — a program that was looking for men to put the program’s experiences into context and exploit those lessons learned through that dark era in ECU football. At ECU, Connors was presented a clean canvas on which he could place his mark not only on a rising program, but also on the industry itself – where today, he is considered one of the top strength coaches in the country and a thought leader in the field. Connors is one of just 36 worldwide strength and conditioning coaches to have earned Master Strength Coach Certification from the Collegiate Strength and Conditioning Coaches Association (CSCCA). Dave Hart, acting on glowing endorsements and Connors’ high-energy, high-demands, high-reward philosophies, made the hire and ECU finally had its spark plug to put in what was building into a football machine in Greenville. At the time, there was no denying Connors’ impact on the program, particularly the players. It is an allegiance, forged in the very sweat that the strength coach demanded of them over and over again, day-in and day-out, that is most illustrated today by the fact that Connors’ staff at UNC is full of former standout Pirates: Guys like Jeff Kerr and Jerris McPhail are there not for Carolina first, but for Connors. To best understand why Connors was the perfect strength coach for ECU at that juncture in time, it is easiest to take a look back in his life. Hailing from Brownsville, PA, Connors grew up in a part of the country where towns, in many ways, are woven together less by county lines and more by prep football programs. To suffice, Brownsville is the quintessential blue-collar, coal-mining, Friday football type of town, and Connors from a very young age was given to it. These ingredients have served him all his life, but particularly as a teen, they helped shape a methodology for life that has since carried him. There, as a 5-9, 190-pound corner, Connors distinguished himself as a competitor who refused to give up on any play. A starter the entire time he was there and team captain as a senior, Connors led the team in interceptions as both a sophomore and a junior. And, it was perhaps during his time as a player there, that Connors developed the mantra that you must finish stronger than your opponent to be a champion. Part of the lessons-learned were from the rigid physical training that Salem Coach Larry Blackstone – who now is a coach in the Ohio prep school ranks – insisted his players go through. Those lessons, borne in sweat, ingrained themselves in Connors, and his post-collegiate career choice only served to further his principles. Connors headed south after graduating from Salem. He found himself looking to make a career in law enforcement, serving as a police officer in South Florida. Though he served only two years, the experience was worthy of a man who would go on to set out life principles for young men. As it was, the action… the intensity of being a flatfoot, stroked the other half of Connors’ psyche. Discipline and Intensity… the method of setting goals, driving to and through them, and attaining them the right way has been a staple in Connors’ methods and the underpinnings for his work all were built through his experiences. And for collegiate strength training, it was a good thing he did. Connors' move into strength training as a profession was preceded by stints as a high school football and wrestling coach at The Benjamin School in North Palm Beach, FL, followed by coaching football at the Tennessee Military Institute. During that period, Connors had made a name for himself through power lifting, where he had climbed the ranks to become a top-5 power lifter, recognized nationally. 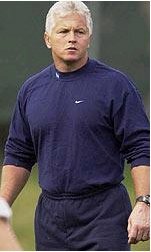 At the same time, he pursued and completed his Masters’ in High School Administration at Bucknell University while taking on the dual role of student/ Strength and Conditioning Coach, with the aim of redirecting his career into either school administration or strength and conditioning coaching professionally. While at Bucknell, Connors had a reputation of inspiring athletes to tap their true athletic potential and as being an innovator in an emerging field. Connors’ style is to commit to an objective and doggedly pursue it and it was no different with the East Carolina job — though he admits that when it all materialized he was uncertain of what was potentially waiting for him at ECU and, honestly, even what ECU was about. Connors quickly made calls, researched the post, and learned about the Pirates. Interestingly, after a five or six weeks, Connors had heard that someone else had been hired by ECU, but that disappointing news was soon debunked when Lewis called Connors to offer him the post. Connors sensed it would be a good move which was confirmed by his conversations with then-Associate Athletic Director Van Sant. Moreover, Connors understood the South. At Bucknell, Connors wore many hats, one of which was the recruiting coach for the wrestling program – an experience he credits to helping him greatly. In that position, without scholarships to dangle, Connors became adept at emotionally connecting with prospective athletes and found he had a knack for making that important bond. That bonding ability would prove an essential ingredient for success as a Pirate. The result was the signing of a great deal of state wrestling champions to that program. When he arrived in Greenville, Connors saw a little bit of good and a little bit of not so good at ECU. But there was a lot of work to make things happen and Connors believed the most important first step was to present the proper image to his new players. The message of Connors’ actions was meant to show his players the level of commitment necessary to be champions. “I wanted to let the players know they had to be responsible,” he said. “I went to find Dion Johnson and got him out of his room. David Daniels was shocked that I came to the dorm. Well, Dion was surprised to see me. They knew I was there to make a statement. He was my first MIA and I wanted to set a precedent. We went straight to the field and ran. The players took note and I think that (the discipline) is what they wanted. Every man who wants to be successful will appreciate the discipline. I looked at the guys like Robert Jones and Bernard Carter and Ernie Lewis and I thought, ‘We’re going to do a lot here.’ They were excited and I was excited to be getting things going. The talented Pirates bought into it wholesale and Connors reinforced it daily. Connors embedded himself into the coaching staff and the group was much more than just colleagues. “I really enjoyed the years when we had a bunch of coaches on staff that liked to have a good time,” he said. “We celebrated some hard fought victories in the middle of the night. “I liked to be around people and there was nothing better than skipping around Greenville after a big victory. Dave Huxtable and I probably had some of the best times of our lives after the games in 1991. Connors employed some unique motivational tactics himself. Without a doubt, Connors and his Pirates connected and what resulted was truly some of the greatest football the program has produced. And, above that, a national reputation of being a team that would never be overpowered physically nor out-endured on the field. The formula that evolved at ECU? “Foundational, really deep,” Connors said. “(You) start out with principle-centered character that you demand all year round. You have guys in the program, guys like Larry Shannon, Jason Nichols, Marcus Crandall, MoFo (Morris Foreman), Emmanuel (McDaniel), Jerry Dillon, the Hart brothers, and Leonard Henry. These guys were very demanding of their teammates. We ran 300s every Tuesday during the summer and those guys pushed it to 10, I didn’t. Though he left ECU, he deeply means every word of his inspired reflections on his time there. Connors is a man who lets passion carry the day. For 10 years, Connors sold out for the Pirate program and, even today — after all of the misunderstandings, the statements on both sides that many, including Connors, wish could be pulled back, and the personal attacks that followed his departure — ECU will always be part of Connors and his legacy will always be a pivotal one in terms of ECU’s growth and recognition as a football program. More than that, the players that saw Connors more like a father, meant everything to him. There were many other stories like that one during the Connors tenure. The relationships with his players have carried him, not only through their successes on the field of play, but on their successes in life, the personal victories. It has been overwhelming to Connors when he looks back on that decade in his life. His players’ attachment to him, even now that he is in the enemy’s camp at Carolina, serve as a strong testament to his person. Tate, Kerr, and McPhail are all on Connors’ staff at UNC and cite the influence of their mentor in helping forge the men they are today. And it has been a mutually rewarding experience for Connors, who has learned a bunch from his prodigies. It was his connection on a human level with his players that created a job description unlike many in the profession. Connors’ routine included spending Friday night putting together some sort of presentation. “It ranged from bringing in Vietnam Veterans to Martial Arts people,” he recalled. “I always like the parallels of training for football and military training. Stuff from the Marines’ War Fighting Skills book. (Topics like) principal-centered leadership. (There was a) guy in Greenville by the name of ‘Gunny’ Born who helped me a bunch. I was intrigued by those (military) concepts. (I saw) a lot of parallels with things I believe about preparation and what was working for the most successful organization in history (Marine Corps). On Saturdays, he would deliver the presentations, complete with guests and props, if necessary. And the result was not only visible on the field, but in the demeanor the players showed coming onto the field, on the sidelines, and after the game. It was a unique role for a unique program that was uniquely successful in a world dominated by bigger budget programs. For Connors, there were a lot of reasons to stay in Greenville, not the least of which was the program and the players. “With regard to East Carolina, one of the huge strengths is the fan base and the support for football,” he said. “I think any coach who is smart, would do everything possible to build up that fan base and recognize those folks from Eastern NC. When I came back from the Peach Bowl and saw the streets lined from Kinston to Greenville… that was incredible to me. Yet, there was a pull for Connors in the form of career opportunity – a carrot he had seen dangled many times before. “I interviewed with Butch Davis for the Miami job the year before I came (to UNC),” he said of one such opportunity during his ECU tenure. “I thought I was passing up a great opportunity because I was very impressed with Butch Davis and what he was working for and (I) felt privileged to be interviewed. I thought he might be going to the NFL and would be a good ticket if that were what I wanted to do. As much as the ECU community is identified with a large hunk of his professional achievement, Connors is clearly cognizant of the lasting impact that Greenville – the home to his family – will forever have on his life. “(If you) stay anywhere for 10 years, you’re going to develop relationships,” Connors said. He is a family man and in a profession that oftentimes keeps dad or mom away from home for long days and nights and weekends on the road. Because of those demands, Connors especially appreciated how the community embraced his family. For both his teen-aged son Beau and his daughter Kaitlin, to hear talk of Greenville is not the conjuring up of a fan-base that took sides for and against their father. Instead, it is a memory of a wonderful childhood in family-friendly town. For Beau it is memories like “…being around the players and experiencing bowl games…” and for Kaitilin, it is days spent swimming. ECU and Greenville are at best, great fibers in the development of Connors, his career, and his family, and at worst, undeniable remnants of a past that was not so bad. Really, despite the buzz around campus of a rumored falling out with Coach Logan, difficulties with then-athletic director Mike Hamrick and rebuffs for a teaching position, the decision to head to UNC came in the form of opportunity. “You know, I’ve been through this before,” Connors said of explaining his decision. “The educational opportunities for my children, the (career) opportunities for my wife, and (my personal opportunity)… I felt as though it would be an excellent career move because (UNC) was the (flagship) school in North Carolina. The resources (at UNC presented) an opportunity to further my career. I really felt like I had a great interview and was excited about what John Bunting could produce. And, Connors felt he needn’t explain his decision. After all, he was leaving behind a strength and conditioning program that was a model for schools around the nation. He had delivered top service to ECU. It’s hard to fault a man bettering his stature in life. And to hear Connors recall it, reveals a little something about beloved coaches all over the country. He was just making a career decision. “The attractive thing about coming to North Carolina was the fact that program was down and needed a shakeup and I was confident I could get it done,” he said. “I had done all I could do (at ECU) and the (UNC) challenge was attractive to me. To have an opportunity to build a high-visibility program was an attractive challenge. One note of interest: UNC and ECU won the Peach Bowl in Connors' first year at each institution. ECU was 7-15 the subsequent two years and its been 3-14 so far at Carolina. "So it is like de ja vu for me," he said. "I’ve been through this before. I guess God wants to see if I still have it in me. Rebuilding process. Very challenging during that time period at East Carolina and it is the same way here." A challenge he is still working to turn around, which underscores the focus that is surely to hover around Saturday’s clash between a Pirate team that does not thinly resemble those from Connors days and a UNC team that looks anything but stronger than the teams that preceded Connors’ arrival to Chapel Hill. So it is, that come Saturday, Connors will be back in Dowdy-Ficklen Stadium for the first time since his departure. He will be in the Blue, not the Purple, and as a professional, he will not be torn on his allegiance during the game. There will be a chip of ego on his shoulder… he does not like to lose and, particularly, he wants to be successful in facing his past. Yet there is still a true kinship with his former program and there are ECU milestones he hopes to some day call his own. “My goal at East Carolina, which may sound lofty and conceited, and I hope it doesn’t,” he said. “I wanted to be the first strength coach to make it to the Hall of Fame. I thought I would be (at ECU) a long, long time. Things change, obviously, and you’ve got to reset your goals. I just hope that people can say that I did a good job while I was there and that we accomplished some things that were unique and that the fans got some joy out of the ’90s. I know I had a great time while I was there. Love or hate him… there is no denying that when Connors was at ECU, whether by fact or folly, he was a big piece of a magical combination in Pirate football history. And… each day since his departure, maybe not so openly, Pirate fans and perhaps Connors himself have come to understand how fortunate everyone was during those wonderful years of progress and victory. 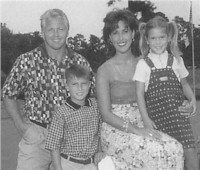 Connors and family in the midst of his stint as a Pirate (1997). Left to right: Connors, wife Michele, son Beau and daughter Kaitlin.